Think about how many times you have walked away from an educational AFP session with a new idea, a new friend, a mentor or just knowing you have made a connection with someone in your profession. Please take a minute make a donation and count yourself in! What is the AFP Every member Campaign (EMC)? 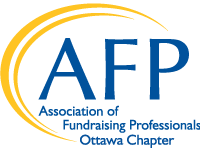 Every year, the AFP Foundation for Philanthropy - Canada, with the help of chapters coast to coast, conducts an Every Member Campaign encouraging all members to donate to their fundraising association. The Ottawa Chapter is proud to be a part of this initiative and to have generous members who care about the well-being of the profession. The programs funded by this campaign support professional fundraisers in the National Capital Region and throughout the country by raising resources to offer education and training, and increase the public's awareness of philanthropy and understanding of fundraising. Each chapter sets an ambitious goal for the amount raised by its own members. If the chapter goal is reached, 25% of the funds raised through the chapter can be awarded back to that region to advance goals in keeping with the campaign objectives - another reason to participate generously, so that our own area can benefit along with the rest of Canada! What is the AFP Foundation for Philanthropy – Canada? The AFP Foundation for Philanthropy - Canada is dedicated to helping fundraisers as they serve communities in need. The goal of the Foundation is to advance ethical and effective fundraising. Learn more about the AFP Foundation Canada.